What does the law mean by an approved child restraint? Child restraints are commonly referred to as car seats and booster seats. A crash tested safety device that is designed for infants and children to protect them in a motor vehicle crash. Babies have heavy heads and fragile necks. If the baby is facing forward in a frontal crash (the most common and most severe type of crash), the body is held back by the straps, but the head is not. The head is thrust forward, stretching the neck. Older children and adults wearing safety belts may end up with temporary neck injuries. But a baby's neck bones are soft and actually separate during a crash, and the spinal cord can tear. In contrast, when a baby rides facing rearward, the whole body--head, neck, and torso--is cradled by the back of the safety seat in a frontal crash. This is true even for babies who have strong neck muscles and good head control. Do not use an infant-only seat, if your baby's weight is over the maximum, (listed on the car seat label) or if his/her head is within an inch of the top edge of the safety seat. Keep your child rear facing by transitioning them to a rear facing convertible seat. You can continue to rear face your child until the child exceeds the height or weight limits of the convertible seat (listed on the label). Can I put my child in the front of a single cab pickup truck? If you have the ability to use another vehicle to transport your child in a back seat; do it. It’s a 53% safer for kids to be in the back seat. Rear Facing – You MUST turn off the airbag. If you are unable to turn off the airbag, the child may not legally ride in that vehicle. Push the vehicle seat back from the dash as far as you are able, and then install the seat. Forward Facing – Push the vehicle seat back from the dash as far as possible. Install the car seat. Pickup trucks can have tricky installs. If you have trouble, contact us at 888-VMT-SEAT for help. You can also look up our fitting station list on this website to find a fitting station near you. How long should I keep my child in a forward facing seat with a harness? 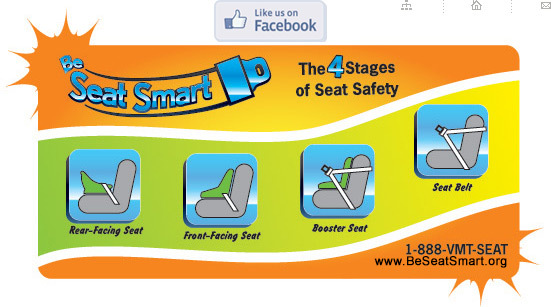 Keep your child in a forward facing seat until at least 40 pounds and 40 inches. Children who are very large may not be ready to move into booster seats at a young age and may need to be harnessed until they mature. Look for seats that have higher weight limits. Labels on the seat and in the instructions will tell you the upper weight limits. 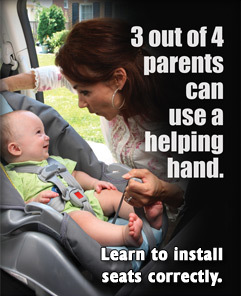 Check the car’s owner manual and the car seat instructions for proper installation of the belts or LATCH. Use the LATCH system or the seatbelt, but not both at the same time. The harness should be tight enough that the webbing cannot be pinched between your fingers at the shoulder. The retainer or chest clip should be at armpit level. Use a top tether with forward-facing safety seats, attached to a designated tether anchor. Never put a rear-facing safety seat in front of a passenger air bag. When your child has outgrown the forward facing, harness seat, it is time to use a booster. We recommend that children stay harnessed until they are between 5 and 6 years old or they exceed the weight and height limits of their 5 point harness seat. (Check the label on the car seat). This gives the pelvis time to develop and harden. The minimum age and weight is age 4 and 40 pounds. What's the difference between high-back and no-back booster seats? High-back booster seats have a back that protects your child against whiplash in cars with low seat backs and provide side impact protection. They can be used in cars with or without headrests on the vehicle seats. No-back or backless booster seats work in the same way as high-back booster seats but no-back booster seats must be used with vehicle seats that have headrests. To protect against whiplash, the headrest should be above your child's ears when he/she is sitting in the booster seat. Both types of seats are effective at protecting children in car crashes. Remember, the lap and shoulder seat belt must be used with both types of seats. The front passenger seat is THE most dangerous position in the car. In Vermont, risk is increased by placing a child in the front passenger seat by 47%. The national recommendation for children is to stay in the back seat until they are at least 13. When my child turns 8, how can I tell if she/he is big enough to use the vehicle belt without a booster? Try the 5 Step Test with your child. If he or you answer no to any these questions, your child still needs to ride in a booster seat. What can happen if my child uses an adult seat belt too soon? The lap belt can ride up above the pelvis (hip bone) onto the abdomen (tummy). When this happens, the internal organs can be damaged in a crash. This is called "seat belt syndrome". In some cases, the spinal cord can be damaged and the child can become paralyzed. The shoulder belt crosses the face and neck and can bother the child. Because of this, children sometimes place the shoulder belt behind the back or under the arm. This leaves him with no protection for the upper body. In a crash, this can cause broken ribs and internal organ injuries. Both of these scenarios result in spine and head injury. Booster seats protect against serious injury 3 ½ times better than seat belts. Booster seats protect against head injury 4 times better than seat belts. No, two people should never use one vehicle seat belt! In a crash, two people sharing one seat belt will collide violently. Buckling two persons into one seat belt could cause serious injury or even death and it is against the law. What about seat belt adjusters? Can they be used in place of a car seat? No. Regardless of how these products are labeled, they do not meet any government safety standard. They may help with shoulder belt comfort, but may put too much slack in the shoulder belt or cause the lap belt to ride up over the stomach. I have a question about car seats/booster seats that is not answered here. Where can I go to get more information? The Vermont Child Passenger Safety Program has a toll free hotline which answers questions about choosing and using child car seats; car seat recalls, and safety seat technician locations. In Vermont, call 1-888-VMT-SEAT (868-7328). Do you need advice on how to wear your seatbelt while you are pregnant? This website; thecarseatlady.com has some good advice about how to wear your seatbelt while pregnant. What is a car seat meant to do? A car seat is meant to protect a child during a crash; it is not a seat for inside the house, a crib, or a seat for using in the store. I like using my car seat in the store to hold my baby. I put him on top of the cart. Is that ok? Car seats are meant to be used in the car, not outside of it. When they are outside, they do not have the same angle as they do in the car. Due to the change in angle, babies can lose their airway and stop breathing. I bought this cool strap cover/mirror/toy to hang on the car seat. I've heard I shouldn't use it...why not? The Vermont Child Passenger Safety Program does not endorse the use of any after-market (non-regulated) products, these include any item that does not originally come with the car seat or is from the same car seat manufacturer; including toys, mirrors, head positioning pads, etc. These items can become choking hazards, projectiles in the event of a crash, and have not been tested with the seat in crash tests. It’s cold where I live. I want my baby to be warm. I got a bunting for my shower and want to use it with the car seat. How do I put it in safely? Car seats are not made to be used with bulky clothes. The thicker the clothing, the looser the harness. In a crash, a loose harness can cause the child to be ejected. The straps of the car-seat harness need to fit snugly against the child’s chest. Use bulky clothes and blankets over the harness, never under. seat cover after being buckled into their seat. Blankets cannot be tucked under the harness or behind the baby’s back. Remove coat before buckling. After the harness has been secured, put on backward with the child’s arms through the sleeves. The jacket-pull-thru method can be used to secure the harness to the child’s body.